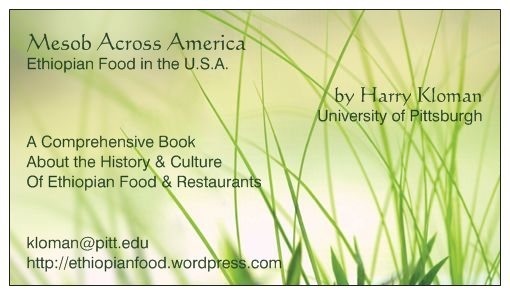 Mesob Across America: Ethiopian Food in the U.S.A. by Harry Kloman is a comprehensive book that explores all aspects of Ethiopian cuisine: its history and culture, the food itself, selected recipes and preparations, and restaurants and restaurant owners. I’ve also created a complementary website that features a guide to Ethiopian restaurants in the United States. 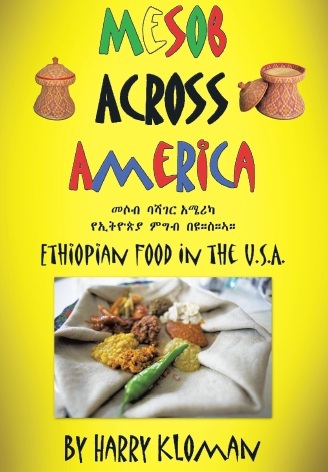 Drawing upon the research of top scholars, as well as the experiences and memories of myriad Ethiopian-Americans, Mesob Across America explores the cuisine of Ethiopia and the community of cuisine that has formed in America during the past half century. ♦ The Ethiopian Meal. A close look at how Ethiopian people eat and why they eat this way, the essential terms and basic elements of the meal, the ingredients of Ethiopian cuisine, the three daily meals, fasting holidays of the country’s three major religions, and finally, “The Enigma of Ethiopian Cooking” – what makes one cook’s food different than another’s. Read a chapter excerpt or buy the book. ♦ A Stroll Through Ethiopian History. This ancient nation’s history in abbreviated form, introducing terms, ideas and elements that will recur and that are relevant to food. Read a chapter excerpt or buy the book. ♦ The History of Ethiopian Food. The cuisine of Ethiopia began to develop in Aksum, the ancient nation from which Ethiopia emerged. What do archaeologists know about what Aksumites ate and when they ate it? And what happened after Aksum? Trace how the cuisine of modern Ethiopia emerged. Read a chapter excerpt or buy the book. ♦ Acquiring a Taste: Europe’s First Encounters with Ethiopian Food. Drawing from historic accounts, this chapter focuses on what European visitors said about the cuisine, from the 1400s to the early 20th Century. Read a chapter excerpt or buy the book. ♦ What To Eat, Where To Eat. What do Ethiopians in America eat, and what do restaurants serve? How does restaurant food here compare to the food back home? 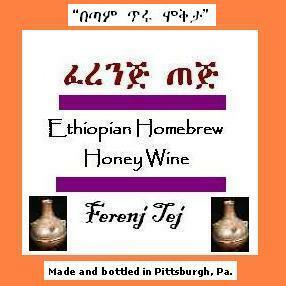 With the growth of the cuisine in America, several Ethio-American entrepreneurs have now started to import beer and wine from Ethiopia, and nearly a dozen wineries make Ethiopian honey wine in America. Read a chapter excerpt or buy the book. ♦ Injera & Teff. The smallest grain in the world, teff is native only to Ethiopia, and it’s used to make injera, the Ethiopian bread. Now numerous farms and companies grow teff in America to meet the burgeoning demand for it. In big cities, Ethiopian women make injera in their homes and sell it to markets, restaurants and individuals. And an Ethiopian engineer has invented an innovative machine that makes injera by automation. Read a chapter excerpt or buy the book. ♦ Ethiopia & Coffee. Ethiopia introduced coffee to the world in the ninth century, and the plant grows native in its temperate highlands. In Ethiopia, people conduct a ceremony to serve and drink coffee, which is an important export crop, although world market prices often exploit the small, poor, rural people who harvest it. Read a chapter excerpt or buy the book. ♦ T’ej: The Ancient Honey Wine. Ethiopians have made t’ej for 2,000 years, and some of the oldest written records that describe Ethiopian food mention it. Learn how to make it at home, where you can buy the supplies you need to make your own, and where you can buy t’ej made by wineries. Read a chapter excerpt or buy the book. ♦ Communities of Cuisine, Part 1: Addis Ababa in America. Washington, D.C., and its Maryland and Virginia suburbs have the largest population of Ethiopians outside of Ethiopia. Trace the history of this community’s emergence and see what it looks like today. Read a chapter excerpt or buy the book. ♦ Communities of Cuisine, Part 2: Urban Life. Some of America’s largest cities have substantial Ethiopian populations. Read about the communities and restaurants of Chicago, San Francisco and the bay area, Los Angeles, and the surprisingly small community of New York City, which doesn’t even have an Ethiopian grocery store. Read a chapter excerpt or buy the book. ♦ Communities of Cuisine, Part 3: Village Life. Here are profiles of Ethiopians and restaurants from cities and states with small or no communities: Alaska, Columbus, Pittsburgh, Michigan, Wisconsin, Iowa, Cincinnati, Indianapolis, North Carolina, Idaho, Utah, South Dakota, New England and Philadelphia. Read a chapter excerpt or buy the book. ♦ Preparing an Ethiopian Feast. Learn how to cook a six-dish Ethiopian meal from scratch, including homemade t’ej. There’s a shopping list, detailed day-by-day and hour-by-hour preparations, and a look at Ethiopian cookbooks that you can buy to further your culinary adventure. Read a chapter excerpt or buy the book. ♦ An Epilogue: Ferenj Tales. Read about the Mighty Mitad and the Pepper Eater, devices invented by design teams in a graduate program at Stanford University that creates products to help poor people in underdeveloped countries. These teams worked on projects for Ethiopia, and both projects relate to food. Then, meet Carl and Pat Templin, an American couple who lived in the south of Ethiopia from 1964-1975, and who share their memories of Ethiopian food over there and back home in America. Read a chapter excerpt or buy the book. ♦ Finding an Ethiopian Restaurant. There are around 330 Ethiopian and Eritrean restaurants in the country – fewer than the number of Chinese restaurants in New York City alone. More than half of these restaurants have websites, and thanks to people who have posted videos on the internet, you can “visit” around 85 of them. The book version of Mesob Across America doesn’t include a list of restaurants because the business can change so quickly. But this website offers a comprehensive list, along with video visits. Visit the restaurant guide or buy the book. ♦ Finding an Ethiopian Market. If you’d like to prepare the Ethiopian feast at home, or if you just want to make t’ej, you’ll need to buy some unique Ethiopian spices and injera to make your meal authentic. A complementary website to Mesob Across America offers a guide to Ethiopian markets that will help you shop online or in person. Buy the book. ♦ Finally, in a series of appendices at the end of the book, you can find out what Ethiopian restaurant names mean and see the recipes for the feast in traditional form. There’s also a bibliography of sources cited in the book. Buy the book. ABOUT THE AUTHOR. Harry Kloman, the creator of this blog about Ethiopian food, and the author of Mesob Across America, is the news adviser to The Pitt News, the daily student newspaper at the University of Pittsburgh; a journalism teacher in Pitt’s English Department; a movie critic for the weekly Pittsburgh City Paper; and the book review editor for Film Criticism, a scholarly film journal. 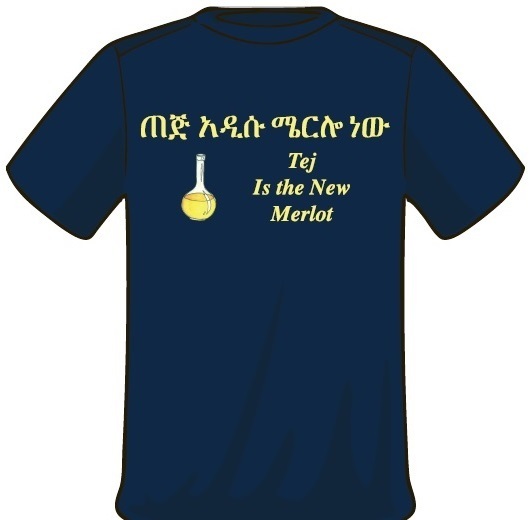 He has also created All About T’ej, a website about the Ethiopian honey wine, which may be one of the oldest forms of mead in the world. The site includes step-by-step instructions for making t’ej at home, a video to accompany the instructions, and information on the history, culture and science of the wine. There’s also a chart with the words for t’ej in Ethiopia’s nearly 90 languages. His largest website is The Gore Vidal Index, which receives about 250 visitors a day. It’s a clearinghouse of information about the provocative American novelist, playwright, essayist and social critic, and it includes some of his own writing about Vidal. Finally, there’s The Pulitzer Prize Thumbnails Project, which he created to keep track of his thoughts about the books that have won the Pulitzer Prize for Fiction. The site also includes some information and trivia about the winners. I welcome comments from visitors, and I’m always happy to answer questions. You can contact me at kloman@pitt.edu.